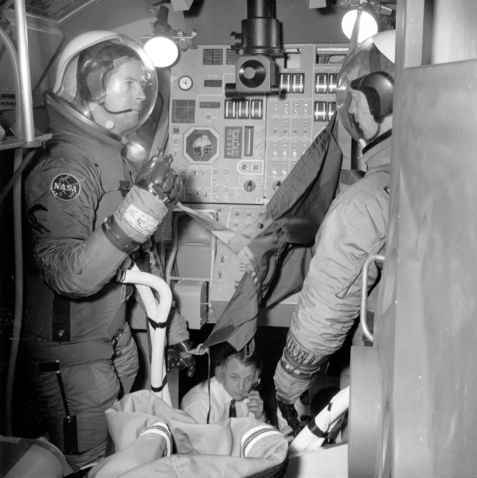 The purpose of the test was to evaluate procedures and hardware prior to committing the Block I to manned orbital operations with Apollo 1 early in 1967. As a result of the test, a number of issues had to be addressed prior to clearing the Apollo 1 mission for flight. During the August 1966 review of the CSM-008 test programme, Director of Flight Crew Operations, Deke Slayton, put forward a suggestion that in future, a flight surgeon should be assigned to the next CSM chamber test crew scheduled to evaluate the Block II CSM for lunar missions (using CSM 2TV-1) to help define medical requirements for Apollo and to provide baseline data that could be used in developing crew training and test objectives. At that time, the only medical doctor in the astronaut corps was Joe Kerwin. Having already experienced the CSM-008 test, it was logical to assign him to the next one.